A Bustle & Sew Publication Copyright ÂŠ Bustle & Sew Limited 2017 The right of Helen Dickson to be identified as the author of this work has been asserted in accordance with the Copyright, Designs and Patents Act 1988. All rights reserved. No part of this publication may be reproduced, stored in a retrieval system or transmitted in any form, or by any means, without the prior written permission of the author, nor be otherwise circulated in any form of binding or cover other than that in which it is published and without a similar condition being imposed on the subsequent purchaser. Every effort has been made to ensure that all the information in this book is accurate. However, due to differing conditions, tools and individual skills, the publisher cannot be responsible for any injuries, losses and other damages that may result from the use of the information in this book. Welcome to the December Issue And here we are again at the end of another year! I simply don’t know where the time disappears to, how can 2017 be nearly at its end? 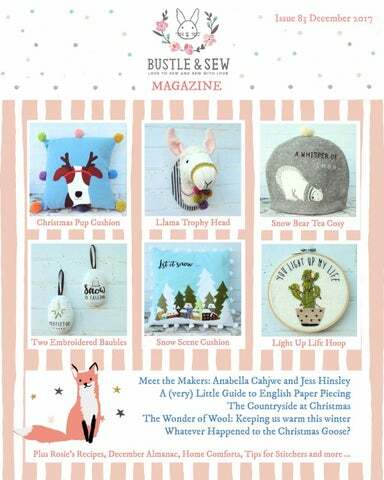 Still it’s been a great year here at Bustle & Sew HQ with lots to enjoy - from llamas to bears via succulents and tea cosies! We’ve lots planned for next year too, and are especially hoping to develop our range of kits which have proved to be extremely popular. Meanwhile there’s lots to enjoy in this month’s issue which, as you’d expect has a very seasonal feel. We meet two very talented makers, enjoy some old family favourite recipes and find out more about the wonderful fibre that is wool too! I do hope you have a wonderful Christmas, and look out for the January Magazine which will be published on Thursday 28 December Merry Christmas to you all! Tips for Stitchers When you’re deciding how many strands of floss you need (if your pattern doesn’t tell you) then a simple rule is never to use a thread which is thinner than the thread of the material – it will look insignificant and puny against the background. My mum taught me this simple rule of thumb and it works in 99% of cases – the exception being if you’re working very fine detail in a small area of your work. The Party Panda hoop above required lots of fine stitching and I got round the problem of choosing fabric with the right weave by choosing to work the design on a felt background - no warp and weft at all!! I’ve started so I’ll finish! What became of the Christmas Goose? disappearing as January begins. Because of this warmth we’re unlikely to see snow this month - in fact statistically snow is more likely to fall at Easter than at Christmas! In the Christian Church, the weeks leading up to Christmas are known as Advent, celebrating the coming of the Christ-Child. Advent begins on the fourth Sunday before Christmas Day which is known as Advent Sunday. It can fall on any of the last four days of November or the first three days of December. branched candelabrum), they found only a single container of olive oil that had escaped the Greeks. They lit the menorah and miraculously the one-day supply of oil lasted for eight days, until new oil could be properly prepared. that later reappeared in England as the Lord of Misrule who traditionally presided over the Christmas celebrations. day villages eat Stargazy Pie on Tom Bawcock’s Eve and sing a song to praise their local hero’s deed. December 14th brings the anniversary of the death of Prince Albert of Saxe-Coburg-Gotha (1819-61, the beloved husband of Queen Victoria. Unlike many royal marriages of the time, theirs had been a true love-match. Victoria was Albert’s first cousin and they married in 1840 when they were both just 21 years old. Over time he became effectively her private secretary and personal advisor. The couple had nine children and their eldest son later became King Edward VII. The day after Christmas Day itself brings the feast day of St Stephen, the first Christian martyr. Here in the UK today however, we chiefly celebrate the day as Boxing Day, a public holiday and a continuation of the Christmas festivities (or an opportunity to recover from the over-indulgence of the day before). It takes its name from the Christmas boxes given to servants, apprentices and other employees and later to tradespeople and public-service workers in the community on this day. The boxes contained a gift, usually of money. Before New Year’s Eve arrives, December 28th brings Holy Innocents’ Day, also known as Childermas, commemorating Herod’s massacre of all the male infants in and around Bethlehem under the age of 2 in an attempt to kill the young Jesus. Warned by an angel, Mary and Joseph had previously escaped with their child to Egypt where they remained until Herod’s death. In the days when Christmas itself was less child-centred, Childermas was a time for indulging children with treats and parties, something that today we enjoy doing throughout the holiday period. Light up Life Cactus Hoop Why can’t a cactus be for Christmas?! Or any time of the year at all of course - this would make a lovely Valentine stitchery too, perhaps with red or pink fairy lights rather than the vibrant multi-coloured ones in this version. This hoop uses just a few stitches - back stitch, French knots and satin stitch - all the cactus “spines” are French knots so it’s a good way to practise this stitch. The cactus and pot are appliqued and then the embroidery is worked over the top. Shown mounted in 7” hoop. ● Trace the cactus shape onto the paper side of your bondaweb (use the template). Allow a little extra at the bottom of the stem so that it can be overlapped by the pot. Cut out roughly and fuse to your green felt. Cut out carefully, peel off the paper backing and position on your backing fabric approximately 3” down from the top edge and in the centre vertically. ● 4” square green felt ● 2” x 3” dusky pink (or preferred colour) fabric or felt ● Stranded cotton floss in light and dark green, black and colours of your choice for the fairy lights. ● Trace pot, cut and position on your fabric so it overlaps the bottom of your cactus stem. When you’re happy with the positioning fuse into place with a hot iron protecting your work with a cloth if necessary. ● The lights are padded satin stitch. Padding the stitches is easy and makes the lights stand out better and not get lost among the cactus spines. Simply work satin stitch the lights from side to side, then return and work a second set of satin stitches from top to bottom over the first set and at right angles to them. ● When your work is finished press lightly on the reverse being careful not to flatten your stitches. ● The text is back stitch and black floss. Make longer stitches along the straight parts of the letters and small stitches around the curves. ● The crosses on the pot are two vertical straight stitches crossed by two horizontal straight stitches. ● The base of the pot is satin stitch. ● The cactus spines are rows of French knots. They have three twists and alternate between light and dark green. Work these first leaving gaps for your lights. ● The flex for the lights is black back stitch. â&#x20AC;&#x153;Doing something different every day!â&#x20AC;? Jess Hinsley tells us a little about herself, her life in a wonky(!) cottage in Wales and her love of art and animals Can you tell us a little about people along the way tell me that your home and where you live? it's not possible to make a living I'm currently living in an old and slightly wonky cottage in Brecon, Wales, with my boyfriend and two friends. We all met at uni and have moved here to save money and be surrounded by beautiful countryside at the same time! It's wonderful! We can see the mountains from our house, and have so much nature right on our doorstep. I've always wanted to live in the countryside! from art, but I knew it was just what I had to do with my life there was no question about it for me! It took me until I was about 17 to know the artistic path that I wanted to go down. There wasn't a college course in my area specifically for illustration, so I took a BTEC National Diploma in graphic design as a stepping stone to the illustration degree course I did at the University of Gloucestershire. If you love Jess’s delicate style and would like to find out more (be sure to check out her 2018 calendar too!) you can find her online …. means you can layer it, giving you a bigger scope for creating interesting paintings. I always finish off my illustrations with coloured pencils, to add detail and texture in my stylistic way. I think the pencil details really bring the illustration together, finishing it off and bringing it to life! How do you keep yourself motivated and interested in your work? I'm so passionate about illustration that it's quite unusual for me to be unmotivated, but it does happen! Particularly in the darker months when Christmas is over and the bleak early months set in. I find having something different to do everyday really helps, either having several projects on the go or taking an 'inspiration day' and going off into the great outdoors with my sketchbook! because I'm planning to go travelling soon, but in the future I want to have a Cavalier King Charles Spaniel, along with several ducks and chickens, and possibly bees! and I now stock four shops in Bristol, six in Wales, and my Etsy shop is blossoming! What has been your biggest challenge in promoting your work online? Where do you find your creative I think the biggest challenge has inspiration? been customer service. I never I draw most of my inspiration from nature, from flora and fauna, to the view of the mountains, and the colours in the sunset! I also use Instagram and Pinterest to keep me inspired: I follow artists and photographers, knitters and ceramicists, bakers and needle felters! really considered that side of things when I began! It was just little me selling cards and prints from my living room. Now it's me in my studio, still learning and improving all the time! I think creative minds need to surround themselves with creativity, and those social media sites are a great treasure trove of inspiration for me. Undoubtedly the freedom! I always knew I wanted to work for myself, I think partly because I don't like being told what to do! But also I feel my most creative when I have freedom in my working practice. I love to be doing something different everyday, and I also love being able to take a few days off at short notice if I need to. And whatâ&#x20AC;&#x2122;s the best thing about running your own business? What are your plans for its future? I hope to continue to grow my Etsy shop, putting my illustrations onto more products, but my biggest aim is to be a published illustrator! I would love to do children's books, that's my dream. And finally, please describe your style in three words. Whimsical, friendly! 5 teacupfuls of flour, 1 teacupful of melted butter, 1 teacupful of cream, 1 teacupful of treacle, 1 teacupful of moist sugar, 2 eggs, ½ oz of powdered ginger, ½ lb of raisins, 1 teaspoonful of carbonate of soda, 1 tablespoon of vinegar Make the butter sufficiently warm to melt it, but do not allow it to oil; put the flour into a basin, add to it the sugar, ginger and raisins, which should be stoned and cut into small pieces. When these dry ingredients are thoroughly mixed, stir in the butter, cream, treacle and well -whisked eggs, and beat the mixture for a few minutes. Mix the soda with the dry ingredients, being very careful to leave no lumps, and stir the vinegar into the dough. When it is wetted, put the cake into a buttered mould or tin, place it in a moderate oven immediately, and bake it from 1 ¾ to 2 ¼ hours. Snow Scene Cushion I was horrified to realise that I’d nearly made it to December without creating a new Christmas cushion! After all, one of my favourite ways to dress my home for the festive season is by bringing out and scattering (quite wildly with a little help from my little grandson, Freddie!) My Christmas cushions. Here’s the first of this year’s patterns then, a lovely freestyle machine applique village with hand embroidered details. And, just for a change - and for extra frosty effect, I’ve used sparkly metallic thread in my machine needle when appliquing the trees and snow. Sized to fit 18” pad. ● Now begin to build up the village overlapping the trees at the back and tucking the bottom edges of the houses under the front snowline. Fuse in the same way and machine stitch. Use gold thread for the roofs and a dark colour for the walls. ● The templates are reversed for tracing onto the paper side of your Bondaweb - and are also full size. ● When your village is finished fuse the front snow and trees and machine stitch around the edges with gold thread. ● Press your work lightly on the reverse. ● Draw in the windows and chimneys on the houses with your temporary fabric marker pen (3). Embroider with two strands of cotton floss. ● Transfer the text and embroider in two strands of black floss using split stitch. ● Trace the white snow and two front fir trees (shape shown in grey above) onto the paper side of your Bondaweb. Cut out roughly and fuse to your white felt. Cut out carefully and position at the bottom of your front panel, aligning the bottom edges. Carefully fuse along the very bottom edge to hold the piece in place but do not fully fuse as you need to tuck the bottom edges of the houses beneath the snow. ● When finished press your work again being careful not to flatten your stitches. ● Place your front panel right side up on a clean flat surface. ● If using fabric hem one 18” edge of each of the rectangles. Place the rectangles on top of the front panel wrong sides down aligning the top and bottom edges so that they overlap in the middle to form the envelope closure. ● Using this first piece as a guide cut out and position the fir trees in the same way. You don’t need to cut the whole tree where they are partially obscured by the houses - just cut enough so that it will be overlapped by the house shapes (1). When you’re happy with the positioning fuse the trees into place being careful not to catch the two front trees with your iron. You may wish to use a cloth to protect your work from the hot iron. ● If using pompom braid then insert into seam with pompoms facing inwards towards the centre of the cushion ● Pin and/or baste then stitch around the edge with a ¼” seam allowance. ● Trim seams and clip corners. Turn right side out and press. Insert pad. ● If using individual pompoms glue to corners, then five evenly spaced along each side using your hot glue gun. Notes: I also added some snowflakes but I donâ&#x20AC;&#x2122;t think they were very successful as you canâ&#x20AC;&#x2122;t see them very well at all. If you want to try, then they were just six fly stitches radiating from a centre point. Adding the white trees and snow at the front first, and just fusing the edge to hold in place may seem like a bit of a faff, but I did find that doing this really helped me position the remaining trees correctly. A (very) little Guide to English Paper Piecing English paper piecing is a traditional quilting technique that dates back to eighteenth century England where it was employed to turn even the smallest scraps of fabric into another useful item - an early form of recycling! English paper piecing itself involves wrapping fabric around paper to make accurate geometric shapes that are then sewn together by hand. Once sewn, the papers are usually removed, leaving behind a beautiful piece of patchwork. Because it's hand sewn it is more fragile than machine stitched patchwork, but it also has its own lovely beauty that speaks of a task undertaken with love and care - the ultimate in slow stitching. going the same way in all of them - either from top to bottom or side to side rather than diagonally. If you do this you will find your finished work is firmer and there will be less likelihood of any distortion either in making up or general use. When you cut your shapes the fabric needs to be around ¼” bigger than the paper shape all the way around so that you can fold the edges over your paper template. The technique known as “fussy cutting” works very well with English Paper Piecing - this is when you carefully position your template and cut your fabric so that a particular part of the design - a pretty motif perhaps - is showcased in the centre of your patchwork piece. To secure your fabric in place ready for joining the pieces together lay your cut fabric shape right side down then pin the paper shape centrally over it. To hold the fabric in place fold the edges over the sides of your hexagons and then tack it down. These tacking stitches do have to be removed at the end which can be tedious and there is a method you can use that avoids this by stitching the corner only. I personally don’t like this method as I find my pieces are less securely held in place and are liable to come loose at odd moments. the block, then you take out the tacking and gently remove the paper to reuse. When all your patches are sewn together, the papers removed, and the outer edges of the patches re-tacked to prevent the material from fraying before it is sewn down onto the lining, you may like to consider feather-stitching or herringbone stitching over the seams, depending on how you’d like your finished project to look. It’s not essential to do this and isn’t to everyone’s taste of course, but it does help to reinforce the seams if your project is going to get a lot of use. Whether it was a gift, a family heirloom or your own creation, many hours have gone into the making of your handmade quilt. Much thought went into the selection of the colours and fabric. The pieces were no doubt cut with precision and sewn together with a great deal of care. Countless hours went into the quilting and then finally finishing off the binding. With all that done, the finished project was a beautiful handmade quilt. This lovely creation can last for years, even decades, but proper care is essential. The following suggestions for tender loving care will assure that your handmade quilt will be as beautiful for years to come as it was when the last stitch of the binding was tied off. ● Wash your quilt rather than having it dry cleaned. The chemicals used in dry cleaning are too harsh for the thread and fabrics typically used. o Always wash your handmade quilt in warm or cold water using the delicate cycle on your washing machine. The individual blocks may be made up of slightly different fabrics which will shrink differently. Also, the vibrant colors may fade over time from hot water. o Gentle detergent should be used when washing. A gentle and inexpensive alternative to special "quilt wash" crystals is baby shampoo. in the way you show off your handmade quilt for decoration in your home. ● Display your handmade quilt in a place where it is not exposed to direct sunlight for long periods of time. This will eventually cause fading and deterioration of the delicate fabrics. ● Don't be afraid to use your handmade quilt. The layers and the warmth of the batting make it perfect for keeping you warm cold winter nights. Even after many years of use, this author has several quilts that are still in excellent condition. ● Refold your quilt every few months. If it is folded the same way for long periods of time, the batting will become permanently creased and thinner where it is folded. A lovely handmade quilt is something you can show off with pride. It should be used, displayed and enjoyed. However, the many tedious hours spent in making it would be wasted if it became shabby due to lack of proper care. Tender loving care will assure that it will last a lifetime and even be passed down to your children and grandchildren. These denim & burlap rustic decorations by Claire from Pillar Box Blue are really quick and easy to make and look absolutely gorgeous hung from your tree! Pop over to Claireâ&#x20AC;&#x2122;s website for the full tutorial. ● 8” x 5 ½” oval MDF blank covered with printed paper. I purchased mine from ebay. In this case you will also need a small D-ring for the back so you can hang your head. ● Join the throat gusset in the same way matching at C and D. Continue along the seams to the base of throat and back of head. Method ● Cut out all pieces from the full size templates (you will need to join the three pieces of the full head gusset together before cutting the single full gusset in felt). ● Turn right side out. ● Insert the base of the felt head through the top of the fur “helmet” and wiggle it down inside (it’s easier to do it this way as the face hole is larger than the hole for the back of the head). Work it into place - it will be a tight fit, but the fur fabric has some “give” which will enable it to fit snugly. ● The llama head is made in two separate pieces. ● First make the felt head shape. Using two strands of white or cream floss and with wrong sides together join the gusset to one side of the head from A to D. Do this with whip stitch first in one direction, then return in the other direction angling your stitches so that they form a decorative (and strong cross stitch). ● When you’re happy with the positioning slip stitch into place around the face and the back of the neck. ● Join the ear inners to outers with wrong sides together. Either machine stitch or use a short back stitch. ● Join the other head side to the gusset. Continue down each seam to join the two sides together. This makes the basic felt head. ● Turn right side out. Fold in half at the base and stitch to sides of head using the photographs as a guide for positioning. ● Stuff the head firmly. Use small pieces of stuffing to avoid lumpiness. Push well into the nose and mould the head between your hands as you go, checking that it looks good and is stuffed evenly from all angles. ● Mark the position of the eyes with glass headed pins. Take your time over this as their positioning will affect your llama’s final expression. When you’re happy with their positioning stitch the beads in place pulling the thread firmly so they sit in little hollows you don’t want your llama to be bug eyed! ● Join the back of the neck using cross stitch again. Go half way round and then insert the card between the felt and the stuffing. Continue joining, inserting more stuffing as you go so that the head is really firm (you don’t want a floppy llama!!). ● Work muzzle in black floss or perle thread it’s basically a very large fly stitch! ● Wrap ric rac braid and felt around nose and stitch into place. ● Set to one side. ● Now you’re going to join the fur pieces. These form a sort of balaclava helmet you are going to slip over your felt head. ● Attach pompoms to bottom of noseband ● With your hot glue gun glue back of head to board or to fabric in hoop if using. If you’re using a hoop then you may prefer to stitch the head in place instead. Make sure the fabric is VERY tight and firmly held in the hoop to avoid sagging. ● With sides facing and a 1/8” seam allowance either machine or hand stitch (in which case use a short back stitch) the top head gusset to the head sides matching at A and B.
point of the needle and pull it tight. Holding this loop firmly between your thumb and forefinger, turn the needle around, place the eye over the loop and push it down so that the thread passes through the eye. to start in several different places and then discover that your work doesn’t join up successfully. If your design requires very dense stitching it’s easiest to start in the middle with the main features and then work towards the edges. your thread under a few stitches at the back before starting to stitch. Try not to run dark threads into light ones and vice versa as they might show through. Finishing a thread This can be done in the same way as starting a thread. If you’re continuing in the same colour, then make a couple of tiny stitches where they will be covered by your next thread. Leave the end on top of your work, snipping it off when you reach it. If you’re using a contrasting colour then turn your work over and run the thread under a few stitches at the back. Never carry threads behind the work across an area that won’t be stitched - this can cause your work to distort, they may catch in wear and they may also show through to the front. It’s important to trim your threads closely once they’ve been secured as threads left hanging will tangle and interfere with your stitching. My grandma used to say that the back of your work should look as lovely as the front and whilst I’m not entirely convinced by this, I do believe that it should be as neat, tidy and secure as you can make it. What ever became of the Christmas Goose? Will you be having goose or turkey this Christmas? Today most people enjoy roast turkey for their Christmas lunch, but this hasn’t always been the case. Both birds have featured on our festive menu for hundreds of years, but the goose was most definitely around first! Anglo Saxon farmers were raising geese long before the new-fangled turkeys arrived from America in the early 1500s. Once it had arrived on our shores however, the turkey quickly became popular and by 1573 the poet Thomas Tusser was recommending it as entirely suitable as an addition to the English husbandman’s Christmas dinner, though it remained an expensive luxury until Victorian times. filling your goose with a mixture of quinces, pears, grapes, garlic, sage and hyssop to make a fruity “sawce madam”, By Georgian times, a stuffing of chestnuts or breadcrumbs, sage and onion very similar to today’s stuffing had become the norm whilst potatoes were roasted before the fire in the dripping pan. Perhaps the most spectacular festive dish of all was the ornamental Christmas pie, filled with boned turkey, goose and a variety of other fowl and game birds. This was a great way of improving the texture and flavour of the turkey - which as we are only too well aware today can be dry and tasteless if not well cooked. The fat from the goose moistened the naturally dry flesh of the turkey making this dish the ideal combination of our two favourite Christmas birds! Tastes of the Season: Stilton Cheese Research suggests that a cream cheese was being made and sold in and around the village of Stilton possibly in the late 17th Century and early 18th Century that was known as Stilton Cheese. Made from pasteurised whole cows’ milk, it has a rich, piquant flavour and a moist, crumbly texture. Enjoying blue cheese may be an acquired taste, but Stilton is a good cheese to begin with as it at has a less aggressive flavour than many other blue cheeses and is less salty. Only six dairies in the world are licensed to make blue Stilton - which is a protected name cheese that by law can only be made in the three English counties of Derbyshire, Leicestershire and Nottinghamshire. Stilton is at its best in the early winter after the cows have fed on the lush summer grass and the cheese has matured for a few months. This is why it’s so popular at Christmas. It’s also great for cooking with so if you’ve any left after the big day try combining it with other ingredients to make all kinds of goodies - you’ll find one of our family favourites in Rosie’s Recipes on the following pages. Rosieâ&#x20AC;&#x2122;s Recipes: Family Christmas Favourites! Every family has its own favourites and traditional Christmas meals, and ours is no exception! I thought you might enjoy some of our tastiest seasonal recipes, beginning with Christmas Eve … As a child I was very determined that Father Christmas would have lovely chocolate cookies to enjoy rather than horrid mince pies! And though I’ve grown to love mince pies over the years, these Oreoinspired biscuits are still one of my faves - and why save them just for Christmas?! Oreo-inspired Cookies Whatever you do don’t over cook these or they will burn and become bitter. ● First make the biscuits. In one bowl combine the cocoa powder, flour, bicarb of soda and salt and in another separate bowl combine the sugar, butter and egg. ● Pour the liquid into the dry mix and combine to form a soft dough. ● Roll out the dough to ¼” thick (you may find it easiest to do this between two sheets of baking parchment or clingfilm). ● Cut out your shapes - they should be around 2” in diameter traditionally they’re round of course, but you can make them whatever shape you like. ● Place the shapes on a greased baking tray and refrigerate for 30 minutes. ● Bake in your pre-heated oven for between 7-10 minutes checking on them frequently to make sure they don’t burn. ● Meanwhile make your buttercream. Beat the butter until pale and fluffy (an electric mixer is best for this). Add both sugars and the vanilla and continue beating until well mixed.If the mix is still stiff then add the milk - it does need to be fairly pliable for spreading onto your cookies. ● When the biscuits are cool spread the bases with your buttercream mixture and place a second biscuit on top to form the classic Oreo sandwich shape. (You may wish to pipe the cream) ● Try to save at least one for Santa!! Bread Sauce I grew up believing that Bread Sauce was a natural part of any roast dinner - and was totally amazed to discover that Mum had never even heard of, let alone tasted, this wonderful accompaniment until, as a young bride-to-be, she visited my Nanna and Grandad (although they weren’t then of course - I wasn’t even thought of!) and was served bread sauce at Sunday lunch. The idea of bread sauce can sound odd, but it is very tasty indeed - a white sauce bulked out with breadcrumbs and flavoured with cloves and onions. It’s medieval in origin, but has somehow survived until the present day. The traditional method involves (to my mind) a lot of faffing about - studding an onion with cloves and infusing the milk - far too much bother on a busy day! Below is my Nanna’s method - much simpler and equally delicious. ● Meanwhile chop the onion finely (Nanna didn’t have a food processor but it is VERY useful for this task). ● Saute the onion in the butter until it’s soft and transparent, but not coloured. ● Meanwhile blitz the bread to crumbs in the food processor - or alternatively slice into small cubes. ● When the onion is soft, stir in most of the milk (hold some back). Bring almost to the boil and then stir in the breadcrumbs. ● Add cloves and seasoning to taste. Method ● Heat the butter in a heavy-based saucepan. ● Stir well and leave to stand. The bread will absorb the milk as it stands and become soft and squishy. If the sauce becomes too thick, then simply add some of your reserved milk. ● Serve warm. Bubble and Squeak This is a great way of using up leftovers from the Big Day itself and in our family we’d traditionally serve it on Boxing Day along with cold meats, chutneys and salads. The traditional way to serve is to combine all the ingredients, form into cakes and then fry. We prefer to heap our bubble and squeak into a pie dish and heat in the oven until the top is brown and crispy as frying can make it a bit greasy in our opinion that is! I’ve given the ingredients Mum told me she’d use if she made it from scratch, but feel free to be creative - we put all kinds of things into ours depending on what wasn’t eaten up the day before! ● Combine all the ingredients in a bowl and mash roughly to bind them all together. Season if you wish. ● Heap the mixture into an ovenproof dish. Dot the top with knobs of butter to help make a delicious brown crust. ● Bake at 180C for 45 mins until the mixture is piping hot (we are reheating leftovers so this is important) and the top is brown and crispy. Broccoli and Stilton Soup Another great way to use up leftovers! We always seemed to have lots of leftovers in our family, perhaps because Mum always insisted on cooking far too much of everything! ● Heat the roil in a large saucepan and then add the onions. Cook on a medium heat until soft but not coloured. Add a splash of water if the onions start to catch. ● Add the celery, leek, potato and a knob of butter. Stir until melted, then cover with a lid. Allow to sweat for 5 minutes. Remove the lid. ● Pour in the stock and add any chunky bits of broccoli stalk. Cook for 10 – 15 minutes until all the vegetables are soft. ● Add the rest of the broccoli and cook for a further 5 minutes. Carefully transfer to a blender and blitz in a food processor until smooth. Stir in the Stilton, allowing a few lumps to remain. ● Season with black pepper and serve. Tastes of the Season: Chestnuts “Chestnuts roasting on an open fire, Jack Frost nipping at your nose …” chestnuts are truly a taste of the Christmas season. The tradition of roasting chestnuts at Christmas originated in southern Europe centuries ago and many chestnuts consumed in the past would have been home-grown. But today, as British chestnuts, though flavoursome, are generally much smaller than the continental variety. The tree isn’t actually native to this country - like so much else it was brought over by the Romans more than 2,000 years ago. It may live as long as 700 years, and in some cases much longer, and will begin to bear fruit after around 25 years of age. Nuts that fall to the ground earlier than mid-October are likely to contain only shrivelled empty shells, shed by the tree as a waste of effort so it can concentrate on plumping up those that remain. Our small British chestnuts don’t keep very well and it’s best to use them within a week of gathering. It’s a lot easier to remove the leathery skin and thin membrane while they’re fresh. They can be boiled or roasted but whichever way you choose to cook them be sure to peel while they’re still warm - cold cooked chestnuts are impossible to peel. a good stiff piece of work cut out for them; three or four and twenty pair of partners; people who were not to be trifled with; people who would dance, and had no notion of walking. But if they had been twice as many—ah, four times—old Fezziwig would have been a match for them, and so would Mrs. Fezziwig. As to her, she was worthy to be his partner in every sense of the term. If that’s not high praise, tell me higher, and I’ll use it. A positive light appeared to issue from Fezziwig’s calves. They shone in every part of the dance like moons. You couldn’t have predicted, at any given time, what would have become of them next. And when old Fezziwig and Mrs. Fezziwig had gone all through the dance; advance and retire, both hands to your partner, bow and curtsey, corkscrew, thread-theneedle, and back again to your place; Fezziwig “cut”—cut so deftly, that he appeared to wink with his legs, and came upon his feet again without a stagger. When the clock struck eleven, this domestic ball broke up. Mr. and Mrs. Fezziwig took their stations, one on either side of the door, and shaking hands with every person individually as he or she went out, wished him or her a Merry Christmas. When everybody had retired but the two ’prentices, they did the same to them; and thus the cheerful voices died away, and the lads were left to their beds; which were under a counter in the back-shop. Thereâ&#x20AC;&#x2122;s always lots of shopping to carry home at Christmas and a good, strong bag is an absolute essential. This one definitely fits the bill and with itâ&#x20AC;&#x2122;s easy applique Reindeer head it will help you get into the Christmas spirit too! Pop ove to our website to download your free pattern. straight stitches worked at right angles to the edges of the shapes. Method ● Fold the front cushion panel in half lengthways and press the fold with your hands. This will mark the centre point and help you position your dog. ● Draw in the mouth with your temporary fabric marker pen and work in back stitch (5). ● Add decorative stitches to the headband - I used bright green and yellow to add French knots and cross stitch. ● You will begin to build the dog shape from the white felt upwards. Trace the shape of the white felt onto the paper side of your bondaweb allowing sufficient for it to be overlapped by the brown pieces (1). Cut out roughly. ● When you’re finished press your work lightly on the reverse. ● If using fabric that may fray hem one long edge of each of your backing rectangles. ● Fuse to the white felt using a hot iron and cut out carefully. Peel off the paper backing and position on your front panel with the bottom edge of the dog aligned with the bottom edge of the front panel. ● Place your front panel right side up on a clean flat surface and place your backing panels right sides down on top aligning the edges so they overlap in the centre to form your envelop closure. ● When you’re happy with the positioning fuse into place with a hot iron protecting your work with a cloth. ● Pin or baste, then machine around the edge with a ¼” seam allowance. This will make the cover slightly smaller than the pad, but that’s absolutely fine, it will help keep the pad firm and plump - nobody wants a floppy cushion at Christmas! ● Now build up the shape by adding ears and body markings (2 and 3) in the same way. Position the nose and eyes using the template as a guide. ● Trim seams, clip corners and turn right side out. ● Finish with the antlers and headband. When you’re fusing your shapes don’t move the iron around as this may cause them to slip out of place. Hold firmly in place for about 10 seconds to give the glue type to melt and fuse. ● Insert pad ● With your hot glue gun (or you can stitch into place if you prefer) add a pompom at each corner and in the middle of each side. ● Your cushion is now finished. day before Christmas. The local fatstock market, thatâ&#x20AC;&#x2122;s the day of days of all the year in the little town - stalls in the square, fat farmers and fat beasts in the cattle-yards, shops full of sparkle and the pubs full of cheer, small spinneys of Christmas trees forever on the move up and down the pavements of the country towns. The lanterns bob down the village streets on carol singing nights, and however unprofessional these rustic songsters may sound, itâ&#x20AC;&#x2122;s just this that makes them all the more endearing. Christmas Day in the countryside - there are the open hearths yet, broad and bricked and crackling with dry oak logs; and country windows, bay, bow or latticed, shielding the inner warmth from the cold, empty and growing grey of the big fields and the bare trees beyond. Broad, bricked open hearths, and above them the cards of Christmas how many of them proclaiming the robin jaunty upon the snow log, ladies and gentlemen proceeding up snowy lanes to church, bowed shop-windows golden with gifts against the blue snowlight of the street. And now there is quiet ness in the big farmyard where the turkeys strutted and shook their wattles in the winter sunlight so short a time ago; and there are some geese the less upon the green. But the robin at the door - he is there, as always, the cherrychested symbol of territorial rights, bright as a holly berry against the white-flowering of the Christmas rose, ready as always, to sing the old year away and greet the new. fifteenth century these taxes were damaging the trade in raw wool, so artisans began spinning wool into cloth at home instead. There are a few stages that need to happen before an animal’s fleece becomes the wool you might see in hanks, skeins or balls in your local yarn shop or woven into fabric for garments. First of course, the animal has to be sheared either by hand or machine. The fleece is graded by its overall quality, the est quality wool coming from the shoulders and sides of the sheep. This is used in clothing, while the fleece from the lower legs goes into carpets and rugs. The fleece then has to be cleaned and scoured to remove grease and foreign bodies which can make up as much as 40% of the total fleece weight. a good quality sewing thread and the right needle when machine stitching wool. I tend to use wool blend felts in my softies for this reason as pure wool felt can be a bit stiff and bulky which makes it difficult to achieve the small curvy shapes required. When joining woollen fabrics bulk can once again be a problem. Choose the right seam finish such as pinking to minimise extra bulk at the seams. And finally, take care when you’re pressing your project. Wool doesn’t like a hot iron and this can cause irreparable damage. Use a cloth when pressing wool or wool blend fabrics - be sure to use a light coloured cloth for light coloured wool! Snow Bear Tea Cosy Here in England we are renowned for our love of “a nice cup of tea” and our belief in its ability to cure all ills! I’m not sure if tea really is a miracle drink, but it’s great to sit down and relax with a lovely cuppa when the festivities all become a bit too much! And what could be nicer than a new cosy to dress your teapot for the winter months ahead? This tea cosy is deliberately not too Christmassy so can be used well into the new year and beyond. Rather than the traditional loop I’ve added a pompom at the top (Rosie says I’ve gone a bit mad on pompoms lately) but I like it!! My cosy fits my Emma Bridgewater 4 cup pot perfectly, measuring 14” across the base, and 10” tall (approx) but I’ve included instructions to make your cosy any size you like, though you may wish to consider altering the size of the embroidery if you significantly resize your cosy. I have given material requirements to make my cosy but again these will alter if you resize your cosy. First measure your teapot’s circumference by wrapping a tape measure around the entire pot,handle and spout included. Divide this figure in half to determine the width of each flat piece, and then add on 1½” for seam allowances and ease. your white felt and cut out carefully making sure there are no jagged edges. ● Position the bear on one of your grey felt shapes - this will be the front of your cosy. His heels should be 4” (approx) in from the left hand side and the base of his feet 2 ½” (approx) up from the bottom edge. ● Fuse into place and secure shape with small straight stitches worked at right angles to the edge of the shape in two strands of white floss. Use these measurements to create the template for your cosy - in this example it will measure 11½” wide x 11” tall. ● The word “SNOW” is silver chain stitch outlined with white back stitch. ● All measurements assume you’re making a tea cosy with the same dimensions as my own. You will need to adjust if your cosy is a different size. ● The stitching diagram for the bear is on the next page. ● As well as stitching the bear and the text I also scattered “snowflakes” over the front of the cosy. These are white star stitches randomly (but fairly evenly) spaced. ● Top stitch the turning gap closed. ● Top stitch around bottom edge, stitching along the join between outer and lining (4). ● Push the lining up inside the cosy (4) Because the lining is slightly shorter than the outer it will sit nicely and won’t protrude along the bottom edge. Press well. ● Glue or stitch pompom to top ● FINISHED! Georgie is a hand embroidery artist based in Gloucestershire UK. She has a BA Hons Degree in printed textiles and creates the most gorgeous hoop art! Marianneâ&#x20AC;&#x2122;s grid is full of her gorgeous pastel crochet creations. We especially love her blankets - they look perfect for snuggling up with this Winter. Gem creates hand-painted artwork on reclaimed wood. We absolutely love her Christmas Eve boxes - be sure to pop over to her Etsy shop to take a look! Cathy was taught to embroider at a young age and since then has continued to stitch, draw and paint. Her grid is full of the gorgeous things she sells in her Etsy shop. â&#x20AC;&#x153;Simple yet playful, cute but not too vintage!â&#x20AC;? Ani Cahwje talks to us about her Curly Life(! ), her Etsy journey and her plans for the future of her super-cute little creatures Can you tell us a little about your home and where you live? How did you come to open your Etsy shop? I live in Brighton, a city on the south coast of England. I'm originally from Argentina, but moved here a few years ago and so far I love it. Brighton is a place full of creativity, diversity and inclusion, which makes it an incredibly inspiring place to live. I started it two years ago when I was not very happy with my full-time job. Every day I was feeling like I could be dedicating those hours to make something I loved, even if that didn't mean much of an income, the fact that I would be making something that made me feel good was enough to me. Can you tell us a little about your creative background? I first started creating when my Italian grandmother taught me to sew when I was about 6 years old. That day we created a ship with two pieces of fabric and some cotton stuffing and I felt that creating something new with such simple materials was magical, so i fell in love with it and never stopped since then. I not only create with fabrics, but I like to experiment with different materials and techniques, basically anything that involves imagination and creativity. I've learnt designing, sewing, patterning, embroidering, painting, knitting, sculpting and modelling, etc. I have a degree in fashion design and although I only make clothes for fun now, I can apply a lot of what I learnt at university in my actual creations and business. I had just discovered Etsy a while ago and I didn't really know how to run an online shop, so I spent two months reading about it and tips to make it work, etc. To me it was going to be just some kind of hobby to keep me distracted from my routine. But after a few months, I realized I was selling more than I had expected and the feedback was so encouraging that I decided I was going to try dedicating my full time to this. And it was worth it! 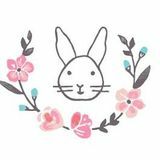 If you love Ani’s adorable animals and would like to find out more you can find her online at “What a Curly Life” …. expressive and their details are amazing. I wanted to make something as cute but not too vintage, so I researched different patterns and modified them to make them look more modern and simple . The material was also important, I had never experimented with wool felt before, but it was getting very trendy so I was curious about it and bought a few sheets to give it a go. I didn't buy much, so I had to make the patterns very little. I think the size my animals have now wasn't intentional, but I ended up loving it and kept them like that! Wool felt can be used in different techniques: depending on the source you can stitch it (that's how I make my animals), needle felt it (this is how I make some of their hair or tails), or use the wet felt technique (like the one used to make balloons). I love your idea for Christmas cards too - do you have any more ideas for future products and/or designs in the year ahead? Yes, I'm soon going to be offering pdf patterns because people keep asking for them and I've been feeling this need of interacting with other artists. I also have a project to make bigger soft toys with woven fabrics like cotton and linen and other materials. How would you describe your style? I think my style is simple yet playful. When I started What A Curly Life I thought my audience would be mainly children but quickly I realised that by adding a playful, entertaining element to my social posts their parents and other adults were finding joy in the brand too and that was when I felt complete about my brand style, because it is very similar to how would I describe myself. How do you keep yourself motivated and interested in your work? Every day I appreciate the fact that I'm doing what I love while I earn my own wage. I feel lucky and grateful for this and celebrate any small achievements. I enjoy doing research as a normal activity when I have a little break. Anything can be inspiring like a picture of real animals, a colour pallet, kid's drawings, interior design, paintings, etc. Sometimes a little detail in one picture can lead to a whole new idea for a new animal, mobile or creation. Normally, good ideas come while I'm making other things and I just stop anything I'm doing and draw them right away. For this purpose, I have a special sketchbook where I keep all my projects and take it with me everywhere I go. Customers can be very inspirational too and that's why I try to always say yes to their ideas. What has been your biggest challenge in promoting and selling your work online? Doing what I love and getting paid for it is the best thing! I know that I can sound a bit clichĂŠ. But I remember being at work in the past and thinking how much time I could be investing on my own goals. Being able to do that in the present has been a great achievement. The second-best thing is that I get to manage my own working times, although this can be as good as challenging, but I love not to have to ask permission for having a day off or a break. What are your plans for its future? I would love to see What a curly life in baby stores. This is one of my big rocks for next year and I am going to be working on it very soon. I'd also like to add more mobiles and animals to the family and offer some bigger stuffed friends dressed up with cute clothes (I want to use my knowledge in fashion design for this purpose). Mainly, showing the best of my products in just a few pictures as my customers are not able to feel or see the real item until they buy it. I did a lot of research beforehand and still do it as I think there is always room for improvement and I feel I still need to learn so much about online business. And finally, for you, what is the perfect Christmas? Dealing with procrastination and managing my own time has also been very challenging as I don't have a physical store, where I open and close at certain times. An online shop is open 24/7, but sometimes the most challenging things can be your biggest advantages as well. I learned to have my big goals divided in smaller goals to know what I want to achieve next and not get distracted. Enjoy it being close to the ones you love, have fun and delicious homemade food. I also like take a moment on my own to look back over the year, give thanks and plan new projects for the future. Two Embroidered Baubles One final Christmas pattern to finish this seasonal issue. Last year I stitched two very traditional felt decorations, but this year’s offering is a bit more modern in very ontrend monochrome highlighted with touches of green and pink. These are surprisingly quick and easy to stitch - I timed myself and it took me less than an hour to stitch the mistletoe kisses design. Baubles measure 4 ½” x 3” approx. As I like to embroider using a hoop I prefer to draw around the oval shapes onto my white felt and embroider before cutting out. Otherwise it would be impossible to hoop up my fabric. ● 12” square white wool blend floss ● 16” narrow black or white hanging ribbon ● Stranded cotton floss in black, white, silver, green and light pink. ● Draw two oval shapes onto your white felt using your temporary fabric marker pen. Transfer the embroider designs and work according to the guide on the next page. ● When finished press lightly on the reverse and cut out the oval shapes. Also cut two additional ovals to form the backs of the baubles. ● Cut your hanging ribbon in half. Use two strands of floss except where otherwise stated Snowflakes are silver French knots Mistletoe leaves are green satin stitch and the stems are green back stitch Mistletoe berries are silver satin stitch Word “MISTLETOE” is black back stitch Word “KISSES” is black back stitch using one strand of floss. Two small pink French knots, one at each end of the word “KISSES”. ● Place two ovals right sides together and join with two strands of white floss and a decorative cross stitch. Do this by working whip stitch in one direction, then return in the other direction to form the stitch. Insert the ribbon at the top with the short cut ends inside the bauble. ● Stuff as you go using small pieces of stuffing and turning and moulding the bauble in your hands to avoid lumpiness. ● Hang on tree ● Merry Christmas everyone! In the Bleak Midwinter …. My garden is cold and bare now, the autumn show is over, and just a few leaves cling to the naked branches, determined to hang on for just a little longer, while even on brighter days the sun, now far away over the Tropic of Capricorn, only briefly casts its weak rays across the winter skies. The countryside around our village is almost devoid of colour as shades of flax, taupe, linen and beige dominate the landscape, though this appearance of lifelessness is deceptive as autumn-sown crops make steady – if rather slow - progress nourished by the last remnants of summer warmth still remaining beneath the surface of the soil. If there is a cold snap then deep frost shadows can linger well into the day and even on into the following nights behind tall trees and hedgerows where the sun never reaches them. We have reached the darkest point of the year, the days are short and cold and by late afternoon the Christmas trees in cottage windows are the beacons that lead us safely home along our unlit village streets. As the festive season approaches, green fields and the muddy paths and puddles beloved of my two furry friends more accurately reflect the usual Christmas landscape than the snowy Dickensian images we love to see on cards. White Christmases are not so common these days , and it’s not unheard of, particularly in the southernmost parts of the country, to see the earliest snowdrops in bloom before the month is out. But for me, a return from a cold and muddy expedition with the Newfies means that its time to close the curtains, light the wood burner, pick up my sewing and dream of Christmases to come and winters long past. Merry Christmas everyone! Home Comforts Vanilla sugar makes a lovely little gift at this time of year. It can be added to drinks or used to sprinkle over cereal or sweeten natural yogurt. It will keep indefinitely in an airtight jar and the longer you leave it, the better it gets! To make your vanilla sugar sterilise a clean glass jar by heating in the oven at 140C for 10 mins or so. Allow to call and then fill with sugar. Use a knife to carefully split two vanilla pods down the centre. Scrape out the vanilla seeds and mix into the sugar. Place another pod or two into the sugar and close the jar firmly. Decorate with an attractive label and attach to the jar using bakers twine or ribbon.